Our non-surgical cavitation in West Yorkshire from £54* per session removes fat by destroying fat cells. 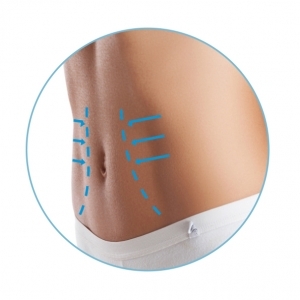 Clients can expect to see noticeable inch loss following the procedure, which has little to no downtime. The completely safe procedure uses ultrasonic waves to target and destroy fat cells without causing damage to the skin or other cells in the body. Cavitation targets areas of concern such as the abdomen, thighs, upper arms and flank. It is used in conjunction with radio frequency or shockwave to achieve enhanced results as part the three-dimensional 3D-Lipo approach. Cavitation is not carried out as a stand-alone treatment. Immediate improvements can be seen following the first treatment. Clients may benefit from a course of treatments to achieve their ideal aesthetic. Results can be permanently maintained alongside an appropriate diet and exercise regime. *To qualify for discounted rates, courses must be booked and paid for in full prior to treatment commencing.